Education Qualification : Officer Grade B(General)- Passed Graduation in any discipline with 60% aggregate marks and 10th, 12th with 60% Marks(For SC/ST/PWD category 50% marks Required). Officer Grade B(DEPR)- Passed Masters/PG Degree Degree in Economics/ Econometrics/ Quantitative Economics /Mathematical Economics / Integrated Economics Course/ Finance with minimum 55% Marks(For SC/ST/PWD category 50% marks Required). Statistics & Informatics from IIT-Bombay with minimum 55% marks. PG Degree in Mathematics with minimum 55% marks and one year post graduate diploma in Statistics. M. Stat. Degree of Indian Statistical Institute with minimum 55% marks. Passed PGDBA jointly offered by ISI Kolkata, IIT Kharagpur and IIM Calcutta with minimum 55% marks(For SC/ST/PWD category 50% marks Required). 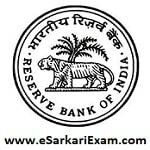 Eligible Candidates can Submit Application at the Official Website of RBI latest by 23rd July 2018. Open Recruitment of Officers in Grade B Link.